Learn the right way (and the wrong way) to lace your shoes. STEP 1 You can tie the starting knot by passing the left lace over the right (shown at left), or by wrapping right over left. Either method can yield a balanced knot or a granny knot—it depends on what you do afterward. STEP 2 Next you make a loop with the right lace (shown at left) or the left. Either choice can yield a balanced knot or a granny knot—independent of which starting knot you made. It comes down to what you do next. STEP 3 Then you circle the other lace around the loop you just made—either in front or in back of the loop. The right choice depends upon how you did steps 1 and 2. (In the knot shown at left, back is correct.) To see the proper last step that matches your technique, consult the chart at right. 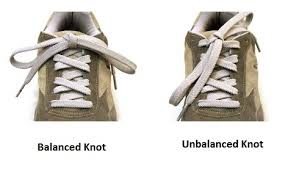 If properly tied with a reef knot, your shoelace bow should sit sideways across the shoe. If you instead tie a granny knot, your shoelace bow will probably twist to become angled or perpendicular.